Grassfed food you can trust. For you, your children, and grandchildren. "Just wanted to let you know how beautiful and delicate your beef and lamb are. Thank you for selling me half of steer #5; he made me very happy!" Our 100% Grass-Fed Red Devon beeves fatten well on grass. Their tender meat offers a more subtle flavor than grain-fed beef, is easier to digest, and carries essence of pasture and soil. Our Katahdin Lamb is tender, offering a light, sweet flavor. The Katahdin breed is a “hair” sheep, which does not present a musty, gamey flavor, typical of wool breeds and grain-fed lamb. Our Cornish Cross Chickens are moved twice a day to fresh grass, enhancing their dense meat and rich taste. Our Berkshire Hogs enjoy the nuts and shade of rotated woodlots, making for smooth and buttery meat. We move livestock to fresh pasture every one to three days. Herds of beef and flocks of sheep are never fed corn, nor are they given antibiotics or hormones. Their diet consists of legumes, warm and cool-season grasses, and forbs, as well as mineral provided by kelp and sea salt. The constant movement of livestock mimics that of wild buffalo herds, which benefits pastures by allowing them to rest for a periods of 30 - 60 days. Meat-chickens and laying-hens receive a ration of non-GMO grain, while grazing pasture daily. Grass-fed foods generate a positive environmental impact because they rely on the sun and grazing-management to grow, rather than on petrochemicals and fossil fuels. The grazing system we employ creates its own fertilizer by building organic matter in the soil. In doing so, it pulls carbon and water from the atmosphere and stores it in the ground, offsetting pollutants. 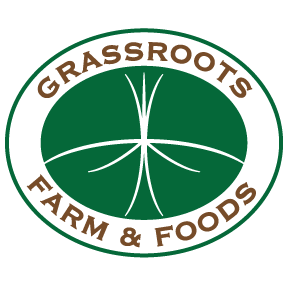 Grassroots Farm & Foods produces beef, lamb, pork, chicken, eggs, and prepared foods for sale in Cynthiana, Ohio – approximately 85 miles east of Cincinnati and south of Columbus. It is located in the legendary and biodiverse Beech Flats of Pike County. We operate independently from the industrial food system, delivering food directly to you through drop-off locations and farmers markets. We invite you to visit this beautiful farm and develop an ongoing relationship with its animals, land, and people. In addition to prime cuts and packaged prepared foods, we sell discounted bulk meats, offering great value. These includes wholes, sides, and quarters of beef; wholes and sides of lamb; wholes and sides of pork; and whole chickens. Bulk meat is available by packaged weight. Whole beef is also available by hanging weight, typically picked up by the customer at the processor in Wellston, Ohio.